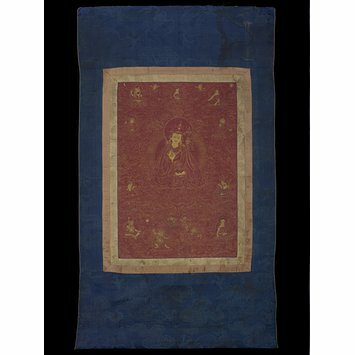 This scroll painting or tangka depicts the great 8th century Indian tantric teacher Padmasmabhava. He is surrounded by the main eight forms he is believed to have assumed to teach Buddhism and to destroy demons in various nearby countries. In 779 the Tibetan emperor Trisong Detsen invited him to Tibet from Uddiyana (the Swat Valley in Pakistan) to subdue demons. The demons were opposing the founding of the first Tibetan monastery at Samye. Padmasmabhava is especially revered by the ‘Old Order’ or Nying ma in Tibet, and has the status of a Buddha. This is a particularly fine example of a gold tangka or Sertang (transliterated Tibetan: gSer t’ang) painted in gold on a red background. 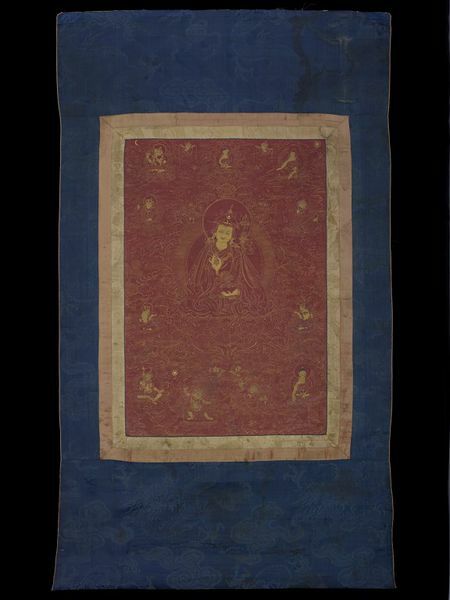 A scroll painting or tangka depicting Padmasambhava at the centre surrounded by his eight main forms. Padmasambhava, a great Indian tantric teacher of the 8th century is believed to have come from Tibet from Uddiyana (possibly the Swat Valley in Pakistan) to help the founding of Samye, the first monastery in Tibet, by subduing the demons opposing it. He is revered by Tibetans as an enlightened being and is especially important to the Ningma or "Old Order." Scroll painting showing Padmasmbhava, ser thang. Tibet 18th century.